Surviving Heartbreak Valley"s excert read by Linda. Oprah Winfrey interviews Linda. This book is courageous and insightful. It allows a glimpse of the underlying behavioral patterns and needs, in the author’s quest for validation. Linda Walls has touched so many of us with her story of resilience and determination. As I got to know her, my admiration has grown. Linda has turned her private issues of domestic abuse and violence, into issues of public education, awareness and prevention. Linda Walls is an intelligent and driven woman who exhibited two strong validation needs in my reading of this book. Validation came by way of achievement and by men. This book was written to allow the reader to examine many aspects of the author’s life, and decisions she made. Intimate details of sexual encounters as well as domestic violence episodes, capture the attention of the reader and their inclination to be judge and jury. This book is a guide for those in the field of domestic violence, mental health and public health professionals; and policy makers. Phil Angelo, Editor of The Daily Journal, Kankakee, IL. A Unified Approach. Houston, TX: Strategic Book Publishing and Rights Co. 2013. Linda Walls is now an advocate against domestic violence and stalking. She dedicated her life to those goals after losing her four children in a fire that their father set back in 1989. She had tried to escape Vernon Howery for many years, haven given him many opportunities to be a good husband and father. She finally pulled away from him and was attempting to start her life anew when she returned home one evening to find her home ablaze. (She had left the sleeping children in the care of two adults when Bernon showed up at the house and told them he would stay with the children and they could leave.) Bernon set the house afire and left. He later claimed he thought someone would call the fire department and the children would be rescued in time. He was arrested for the fire and the murder of their four children, ages five through eleven. “Surviving Heartbreak Valley” chronicles Linda’s story of meeting Bernon Howery and how he used his dominating personality to keep her hooked and then, once she tried pulling away, stalking her relentlessly and influencing her to take him back many times. The one good thing Linda received from the relationship was her lovely children, who he finally took away from her as well in a violent, selfish and callous way. Bernon was sentenced to death but later was re-tried and, due to one juror’s vote against death, was given life in prison without parole. As he began servicing his new sentence Linda tried to get on the best she could with her broken life. Linda’s story is, indeed, heartbreaking. Any woman who has lived under an abusive man’s thumb will feel the familiar despair resonating in her words. One of my favorite passages is where Linda addresses those who would say she should have just left, where she chronicles that she tried many times and how no one can really criticize a woman stuck in that type of relationship, unless they have walked in those shoes. She further cites an instant where a judge warned an abused woman that a peace bond is just a piece of paper. Having retired from a career as a support staff person in a police department, I saw many instances where women were stalked and sometimes murdered who had an official restraining order against their stalker. Linda has coped with her heartbreak by getting heavily involved in scrutinizing and challenging current laws on stalking and advocating for the rights of abused women. She lives with her teenage daughter in Illinois. 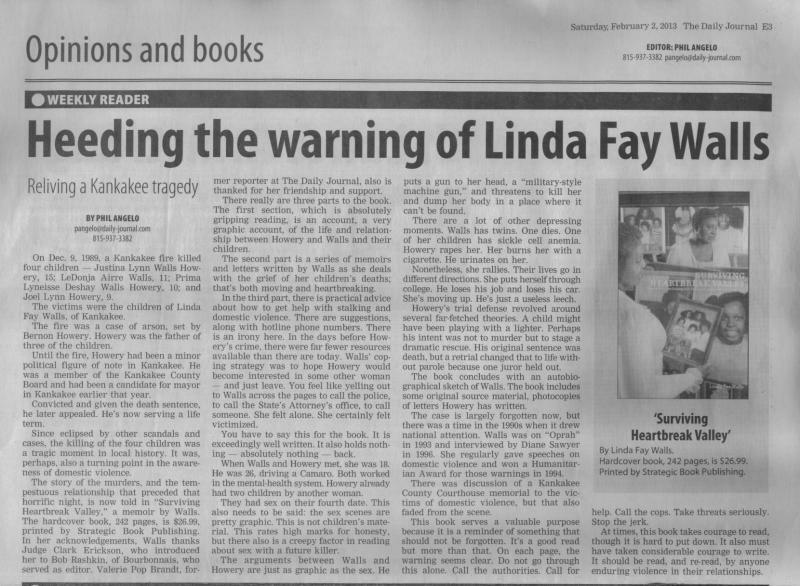 You can read more about her story by purchasing her book and visiting her website http://www.lindawalls.net. Linda Walls brought her story of overcoming domestic violence to the Kankakee Public Library, located in the community where the tragic events of her book took place. People who knew her and her children gathered to show support as she bared her soul. Her loss is a story of survival, perseverance, and hope. Many can only imagine the pain that she experienced during this time in her life and she brought that feeling to the surface with her raw emotions. It was a very powerful evening that left people talking about it days and weeks after. We hope that by sharing her story it helps even one person in our community. Linda’s speech shows that there can be a light at the end of the tunnel; she proves that it’s possible to muster the strength to carry on and live life to the fullest after a horrific experience. This is a powerful telling of a tale of abuse, tragedy and redemption. Well written, thought provoking, from the heart. Highly recommended. The book describes the author's relationship with a manipulative and ultimately violent partner, and her own recovery from tragedy. " "Surviving Heartbreak Valley is a real life earthbound experiencing book. It creates within the reader thoughts of happiness, anger, and the wanting of deliverance as the story unfolds. It unveils the misuse of masculine power that can be displayed or applied upon a woman who offers Love to a Man, but he in return offers up deliberate bad intention. The intimacies that are mention between the pages communicate a message as to how important it is to guard that special gift that the Creator gave us all "LOVE" Surviving Heartbreak Valley (SHBV) Is a Life filled book that speaks with simple well meaningful terminology that all can comprehend it conveys excellent strategic, and tactical usage for men and women of all ages. Harry Rush doc.ret. " Copyright 2012 Linda Walls. All rights reserved.